Due to the sadly recurring news about further cases of Legionella infections, we return on the topic of how a proper maintenance of cooling plants is crucial aimed to the safeguard of public health. The BN 111U product employed by Tempco for evaporative towers purification is a specific active bactericidal, antimicrobial and algae treatment for humidification and rain test chambers, cooling circuits and paper mill processes. The product TC BN 111U by Tempco is particularly effective for the treatment of Legionella Pneumophila bacteria, both for use as initial antimicrobial Legionella treatment and in a successive prevention program. The product can be employed in a starting shock dosage aimed to completely eliminate all the existing bacteria, to be repeated every 2-3 days until complete control of the bacterial proliferation. Further following shock dosages can be used as a prevention treatment. Also a continuous dosage treatment in the system can be adopted for legionella prevention. The product can be added manually or automatically, employing a timer-controlled dosing pump. 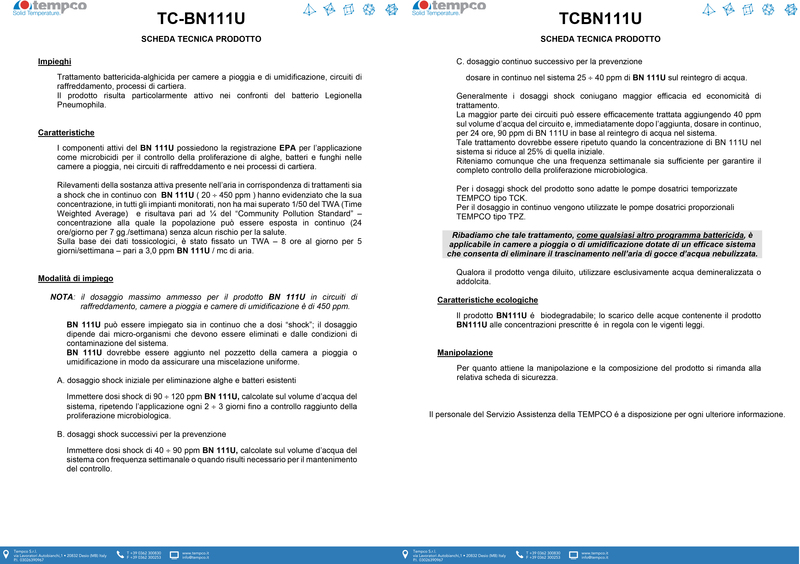 The technical sheet of the TC BN 111U product reports in details the correct employ mode and dosage informations both for eliminating existing Legionella bacteria and for an effective successive Legionella prevention.